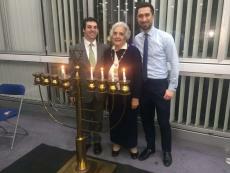 Lewisham Council, alongside Catford and Bromley Synagogue, hosted what is thought to be South London’s largest Chanukah celebration on Thursday night. Sufganiyot and Latkes were bought in from Finchley for the 150 people who packed into the Town Hall for Lewisham Council’s first ever Chanukah lighting. Damien Egan, the Mayor of Lewisham, lit the evenings first candle. While Lewisham’s Mayoress, Kindertransport survivor Liane Segal - lit the final fifth candle, in a celebration that saw representatives from across Lewisham’s faith community come together.